“Monkey fun takes more than one,” says the monkey in a jungle tree. Soon nine monkeys join him and they begin their monkey fun! Funny, fanciful paintings of ten monkey friends by Anne-Sophie Lanquetin combine with the rhythmic, rhyming text to make a cheerful “read-aloud” picture book. Readers will discover just how many monkeys it takes to make a jungle jamboree while learning how many different combinations of numbers add up to ten—with a rousing good story mixed in! 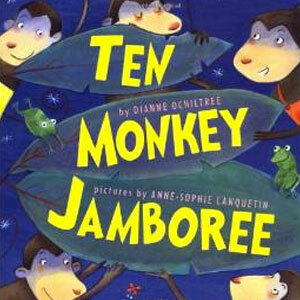 Ten Monkey Jamboree has been published in the UK, and in French and Korean editions. Was featured selection in Scholastic Book Clubs as softcover/audio package.